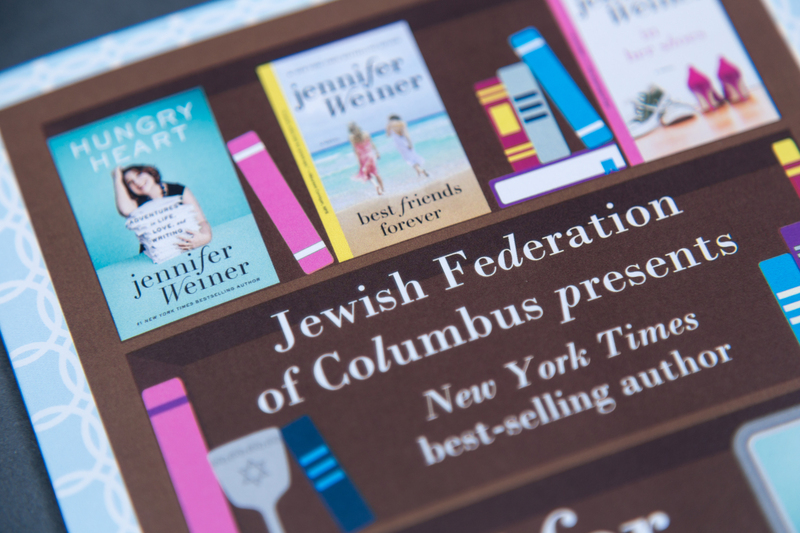 As part of the programming offered for their women’s philanthropy group, the Jewish Federation of Columbus was holding a keynote event with New York Times bestselling author Jennifer Weiner. 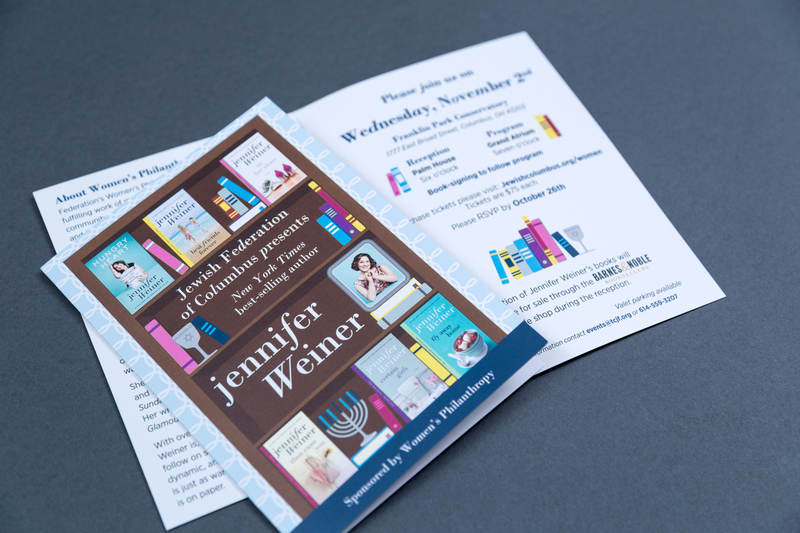 They wanted the branding of the event to align strongly with the author’s book covers, feeling that the audience may be more familiar with the covers than her name. 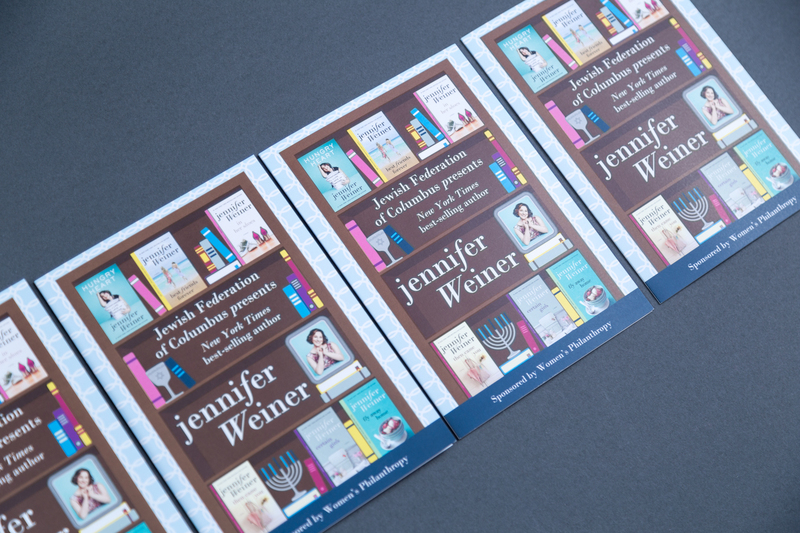 I created an illustrated motif of a bookshelf, featuring very simplified book spines, a photo frame, and a few items that Jewish women might have in their own homes on display, mixed with cover designs and the author’s photo. 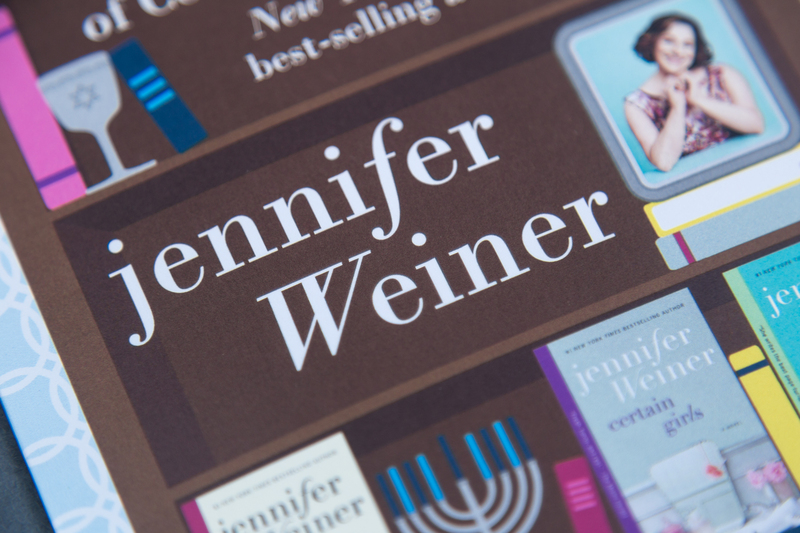 I created a color palette for the illustrated elements pulled from the Jewish Federation’s brand identity and colors from the book cover designs. To add continuity, I completed the bookshelf illustration with a “wallpaper” made of the women’s philanthropy group’s interlocking circle pattern I’d designed for a previous event. For text elements, I replicated the stylized lettering used on the author’s book covers, mixed with the Federation’s brand typeface. The versatile bookshelf illustration adapted well to several different applications. The web graphics featured a shelf from the illustration, sized to accommodate each platform. 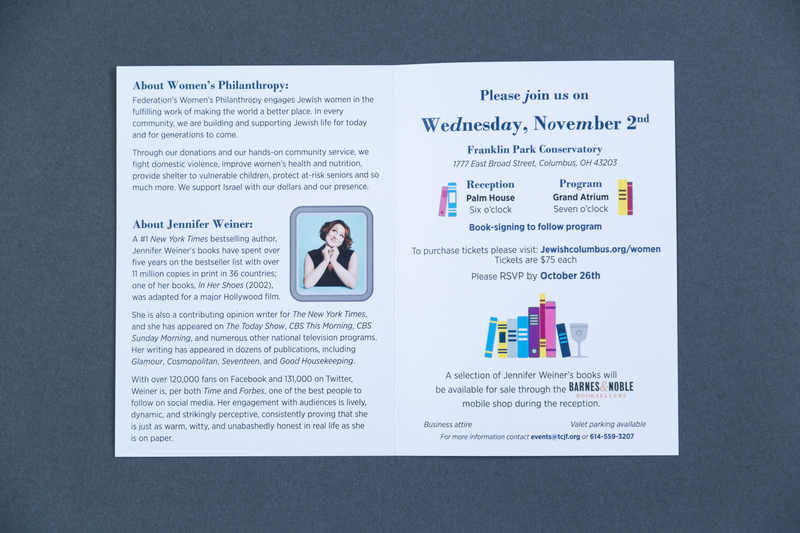 I also pulled individual elements from the shelves to use on the interior of the invitation and in standalone graphics for newsletters. 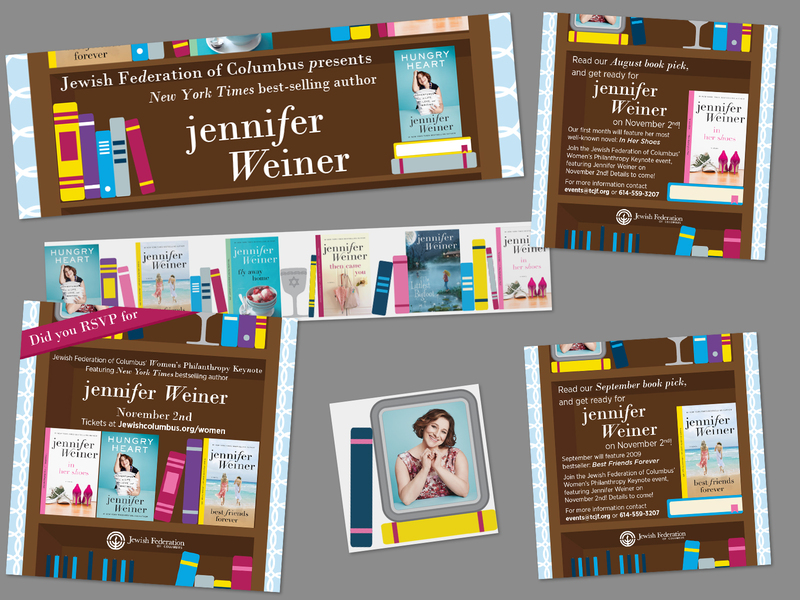 The client ran a virtual book club to build anticipation for the event, so I created a series of graphics for that newsletter and social media campaign, featuring the selected month’s title. 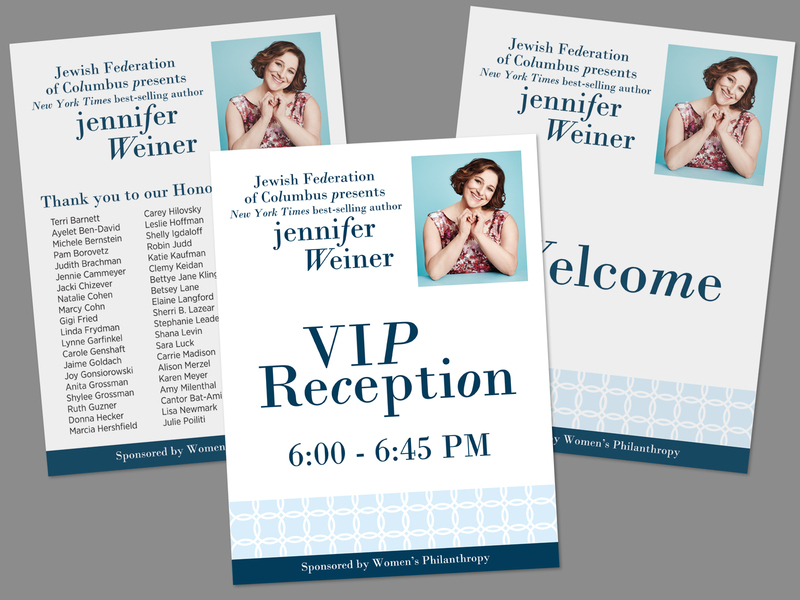 For the event signage, I scaled back the design to just include the group’s pattern, the stylized text treatment, and the author’s photograph. 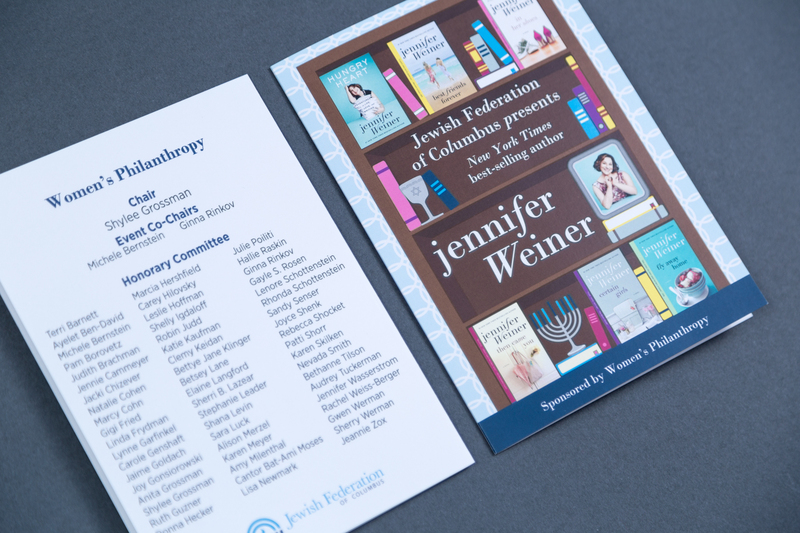 The result was a cohesively designed event, which tied into both the parent organization’s branding, the group’s established visual motif, and provided the right amount of whimsy and recognition to fit the author’s work.